South Africa: #budget2019 - Tight Health Budgets Are Here to Stay. Here's What We Can Do About It. A clinic in Osizweni, Newcastle. It's official. Austerity budgets may be here to stay. Here's how South Africa should be working with what it's got to provide healthcare. It's a new year but the same headline-grabbing story: Qualified doctors, nurses, pharmacists and other healthworkers sitting idle with the kind of degrees we typically think would be immune to economic downturns. "One hundred young qualified doctors and pharmacists unemployed in KZN" one news story reads. "Unemployed doctor: Sometimes I can't wake up because I feel like I don't have a purpose" cries another. Before 2012, South African public health expenditure grew by as much as 7% year on year - driven by the costs of the country's successful HIV treatment programme. Our reading of the 2016/17- 2018/19 Medium Term Expenditure Framework finds that although the health budget is increasing beyond inflation it isn't enough to keep up with the higher inflation rate for healthcare products and treatment, often called medical inflation and salary increases, a 2017 Rural Health Advocacy Project (Rhap) working paper argues. National pressures are filtering down to provinces that rely on national treasury allocations for up to 35% of their health budgets, according to the Financial and Fiscal Commission's 2019-2020 report. The commission - an independent, statutory body - advises the government on financial matters. Based on Rhap's budget research and our work in provinces, we know funding constraints are behind a lack of posts for healthcare workers, including new medical graduates. But the way these hiring freezes are managed gives little consideration to how they impact service delivery. Healthcare is about people and systems can't function without not only doctors and nurses but also people such as physiotherapists, procurement officers, financial managers, cleaners and porters. It's important to remember that what makes a post "critical" depends on the context - a cleaner can be as important as a doctor in ensuring that a clinic or hospital can provide quality care. It should be up to local districts in consultation facilities to define what they need most and when. In response to Rhap's recommendations, the national treasury has also issued directives to protect frontline health workers. But without accompanying guidance to support health managers to adhere to these instructions, the treasury's efforts haven't halted the freezing of critical posts. We've tried to fill that gap. In 2015, we published what we called a toolkit for healthcare managers to "rural-proof" their services. It was a framework designed to help people think about solutions for the challenges of providing care in rural areas - far-flung, historically under-resourced regions where the distances between communities and clinics, and between facilities, are far. The concept takes the six components that the World Health Organisation says are critical to health systems - things such as human resources, information systems and access to essential medicines - and helps healthcare managers to think through these from a rural perspective. To test whether our tool could help rural districts to navigate austerity measures, we took it to the North West's Maquassi Hills Local Municipality in the province's Dr Kenneth Kaunda district near Wolmaransstad in 2018. The rural-proofing tool couldn't solve the province's financial woes - it didn't magically put more money into their health budget but it did provide local health managers with a plan with concrete steps that they could use to navigate shrinking health budgets. What we call "ruralproofing" isn't too different from global thinking about what makes health systems resilient. Researchers from the London School of Hygiene & Tropical Medicine looked at three international events that shocked health systems - Europe's 2008 financial crisis, mass migration and climate change, as well as West Africa's 2013- 2016 Ebola outbreak - and asked what made health systems better able to cope with these changes. They found that countries with strong information systems were better able to make decisions during crises. This combined with the right financing mechanisms to fund what needs to be done - and planning around the people to do it - enabled healthworkers to better weather unexpected storms, a 2018 article published in Health Policy and Planning found. "Well-integrated and locally grounded systems may be more resilient to shocks," researchers explain. In South Africa, governance may need a rethink. Although, in theory, provincial and national legislatures are important accountability bodies, they seldom have sufficient capacity to fulfil this role. The National Health Act envisions citizen oversight in the form of hospital boards and health committees that remain dysfunctional. Meanwhile, the ringfenced conditional grants that fund some programmes, such as HIV, and national treasury's formulas for dividing funds between provinces and departments are outdated. There are, sadly, no quick fixes for the country's latest crop of unemployed healthcare workers but we can start to find solutions. We can begin by figuring out where our health workers are and the national health department should release this data, including breakdowns between rural and urban areas as well as clinics and hospitals. More broadly, we should use this crisis to address the gaps that will make the public sector an employer of choice, one that creates dignified workspaces that, in turn, prioritise dignified, respectful care. 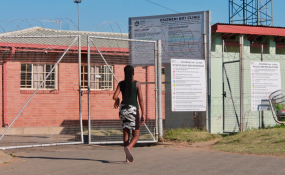 It is time to take government's Batho Pele principles - including those of access, openness and consultation - that are posted on our clinic walls and put them into practice. Russel Rensburg is the executive director of the Rural Health Advocacy Project. Follow him on Twitter @russ421.